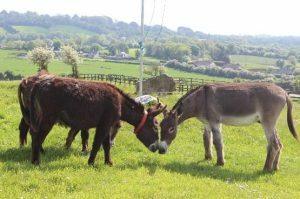 The Donkey Sanctuary, Ireland is 30 years old, come celebrate with us! We are having an Open Day on Sunday 24th September at Hannigans Farm, Lackaroe, Liscarroll, Mallow, Co.Cork. This is a great opportunity to see a farm that is not usually open to the public. Hannigans Farm is home to our veterinary hospital, isolation unit and over 400 of our donkeys. The fun filled family day will run from 12 noon to 5pm. Admission is €5 per car. (Activities and games carry additional charges). Activities on the day will include donkey grooming and walking, tractor trailer rides, bouncy castles, craft stalls, a farriery demonstration, fun games, prizes and lots, lots more! Don’t miss this super day out. Join us, make some new donkey friends and celebrate 30 years of The Donkey Sanctuary in Ireland! Please note that the event will go ahead weather permitting. Check our social media and website www.thedonkeysanctuary.ie near the 24th September.